Gernot Rieder is a Postdoctoral Research Associate at the University of Hamburg, Department of Informatics, and member of the Ethics in Information Technology (EIT) research group. 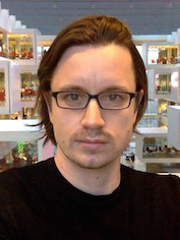 In his dissertation (IT University of Copenhagen), Gernot investigated the rise of Big Data in public policy and the social and ethical implications of algorithmic decision-making. His current research focuses on the history of statistics and computerization, the ethics and epistemologies of evidence-based policy-making, and questions of trust in IT. From 2014 to 2018, Gernot served as an Assistant Editor for the journal "Big Data & Society". He is webmaster for the Austrian Association for Science and Technology Studies (sts-austria.org) as well as the Navigating Knowledge Landscapes research network (knowledge-landscapes.hiim.hr). Rieder, G.; Simon, J. (2017) Big Data and Technology Assessment: Research Topic or Competitor? In: Journal of Responsible Innovation, 4(2), 234-253. Rieder, G.; Simon, J. (2017) Big Data: A New Empiricism and its Epistemic and Socio-Political Consequences. In: Pietsch, W.; Wernecke, J.; Ott, M. (Eds.) Berechenbarkeit der Welt? Philosophie und Wissenschaft im Zeitalter von Big Data. Wiesbaden: Springer VS, 85-105. Rieder, G.; Simon, J. (2016) Datatrust: Or, the Political Quest for Numerical Evidence and the Epistemologies of Big Data. In: Big Data & Society, 3(1), 1-6.